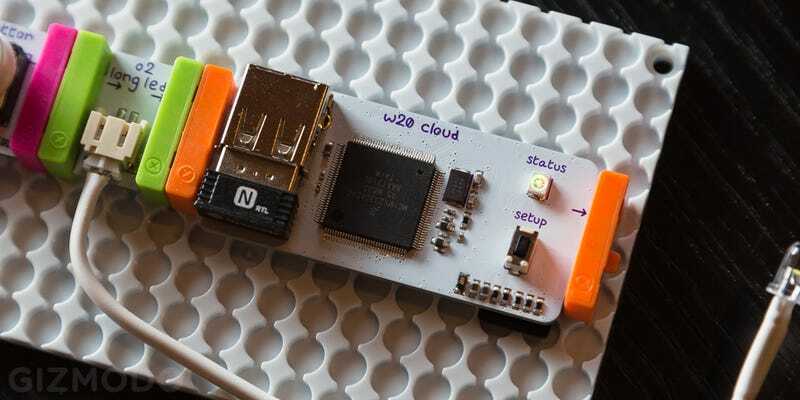 We've known and loved littleBits for some time, and now, they just got a lot more useful with the introduction of cloudBit. CloudBit is a module, a.k.a. bit, that brings internet connectivity to anything. With the rest of the littleBit library, you can now effectively create your own internet of things, no fancy Google products necessary. It's an awesome idea. Not only can you build internet-connected devices out of bits, you can also hack into other devices—anything from a thermostat to a doorbell—and make it accessible in the cloud. "Until now building for the internet of things has been reserved for large companies and experts, limiting the power of what's possible and the rate of innovation," said Ayah Bdeir, founder and CEO of littleBits, said in a release. CloudBit makes it possible to build internet-connected prototypes in minutes. Plus, it's a lot of fun. The cloudBit comes with 4 gigabyte memory card. In the company's own words, the idea behind cloudBit is to "democratize the internet of things." When you think about it, Bdeir's exactly right. Plenty of companies are rushing to control the new connected home market, and unsurprisingly, giants like the Goog and Home Depot have taken an early lead. But it doesn't have to be like that, Bdeir told Gizmodo. "Let's empower people to do something new and exciting," she said. Or how about a Sonos clone? CloudBit enables devices not only to talk to the web but also talk to each other. So you could set up a whole network of cloudBit-powered speakers for a cool, custom sound system. One of these speaker would look nice on your bookshelf, wouldn't it? While all these things are neat, the real question is: Do you really want to build your own internet of things? While smart homes are buzzy right now, it takes a real hacker to devote time to building her own devices, even if the components do snap together in minutes. LittleBits does make it easy. The company lists all kinds of projects on its website and even makes the beautiful industrial design plans available for free download. However, cloudBit could be a transformative tool for someone trying to start a company around the internet of things. Bdeir says that littleBits users are about half entrepreneurs and half hobbyists. All that said, everybody likes building stuff. If littleBits are like Lego with electricity, cloudBit are like Lego with internet. Everything is better with internet.